This Blue Jay stopped by yesterday afternoon to fill up on some peanuts. You can see he still has a few feathers left to fill in from his seasonal molt (around the eye and neck) but he is almost back to his splendid looking self. The pictures of the birds whose faces are still featherless are just too scary to post! 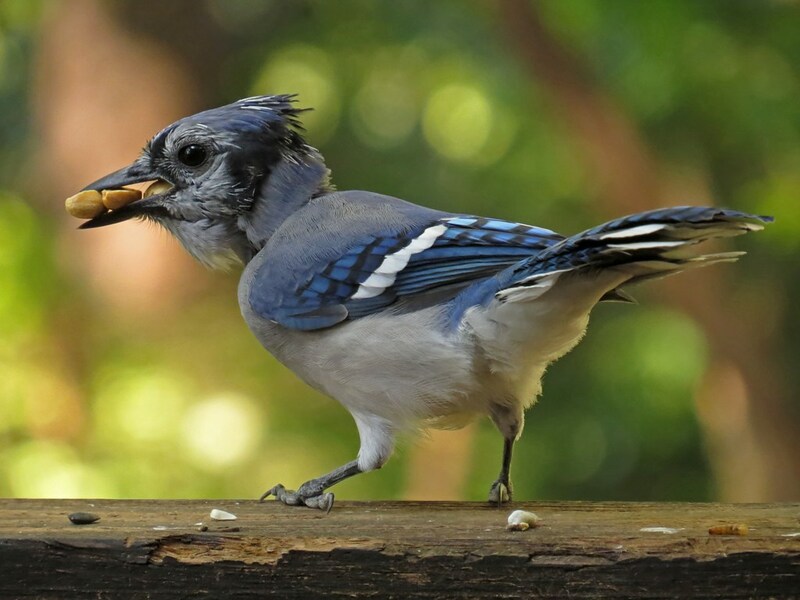 This entry was posted in Backyard Birds and tagged beauty, bird feeding, birds, blue jay, molting, nature, photography, writing. Bookmark the permalink. And cardinals are about the ugliest molters around! I didn’t know that. They are ugly, though. I’ll vouch for that. Oh! We have a bluejay who’s head and neck feathers seemed to be all pecked off! I had no idea they are just slow to coming in ! I feel so much better now ! Thank you ! I thought the same thing the first time I saw a bird molting! Oh my word…he’s stuffing himself like a chipmunk. I have never seen a bird choke. I guess they can gulp their food. Great shot! These guys have a special pouch they pack the peanuts in. It’s amazing how many they can tuck away in one sitting! He’s gorgeous Kathy I wish we had them here.